What’s the goal? Progression or Salvation? 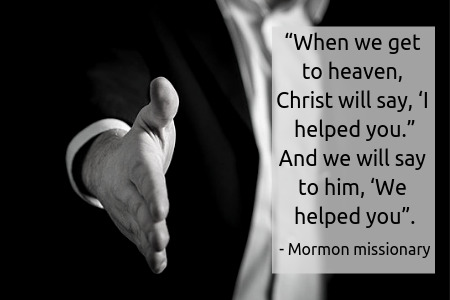 Earlier this week, a man who is witnessing to Mormon missionaries told me that one of the missionaries said at their last meeting, “When we get to heaven, Christ will say, ‘I helped you.” And we will say to him, ‘We helped you”. This reminded me of something I read years ago. A Mormon man wrote that he wanted to meet Jesus face to face, looking him in the eye, man to man. These two comments, separated by many years, illustrate an extremely important point about Mormonism – a point Christians often miss. Because Mormonism teaches that people are God’s literal children and thus have divine potential, its whole goal is to have people progress so they stand on their own two feet – to the point they can picture themselves talking to Jesus like these two Mormons. In Mormonism, salvation is not the goal. It just helps people progress. That is why Mormonism has defined salvation as resurrection. By conquering physical death (i.e. salvation), Jesus has removed death as an obstacle to their progression. But where they end up depends on how well they progress. Psalm 50:15 is a familiar Bible passage. “Call upon me in the day of trouble; I will deliver you, and you will honor me.” What many people overlook, however, is that God says this right in the middle of his condemnation of superficial worship. In verses 7-23 God brings charges against Israel for its hypocritical worship. Then, right in the middle of his litany of accusations he speaks verse 15. In this striking way, he says one of the best ways to worship him is to run to him for help and then honor him for his deliverance. “Help me, Lord” and “Thank you, Lord” are wonderful cries of worship. “We helped you” is not. Salvation, not progression, is the goal the Bible holds out for us. It’s a goal Jesus has accomplished for us without any help on our part. This Thanksgiving weekend, may we see this anew. And may we give him all honor, praise, and glory.